Next tour: Wed 27 September 2017. Meet: Outside the Press Club, Queen Street, off Deansgate, 1.30pm. 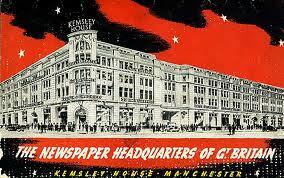 Manchester was once a great press city. 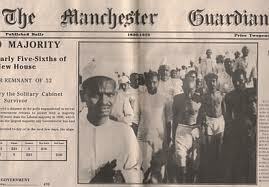 The Northern editions of all the dailies were produced locally, and here was based the greatest of all papers: The Manchester Guardian. Shame that it is now simply the rather second-rate and unreadable Guardian and no longer associated with Manchester. Other newspaper owners just wanted to make money. They did so, handsomely. 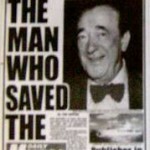 Alfred Harmsworth established the Daily Mirror and Daily Mail, and later bought The Times. No wonder he died of a peculiar mixture of megalomania and acute paranoia, claiming (rightly, it turned out) that the enemy in the Great War had poisoned his ice-cream. Lord Beaverbrook, owner of Express Newspapers, paid for one of Manchester’s most exciting buildings: the Daily Express offices on Great Ancoats Street, but he also dictated policy to the government during the 1936 Abdication crisis. Julius Elias, owner of the mighty Odham’s, which published The People (once based at what is now the Printworks), was seriously eccentric even by Fleet Street standards. He refused to keep pennies in his pocket, had an irrational loathing of green (he refused to allow his wife to wear a green dress), and hated any design that featured peacocks, so much so that arriving home one day and finding a new carpet bearing an heraldic pattern, he announced: “looks like peacock to me”, and had it removed. Even after death Elias ran his papers, supposedly, for his successor, A. C. Duncan, a keen spiritualist, claimed he held regular “consultations” with his deceased predecessor. 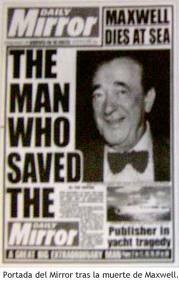 But none of these compare with Robert Maxwell, late 20th century owner of Mirror Group Newspapers. Maxwell, a boor and a bully, bought the former Kemsley House plant on Withy Grove (once the largest newspaper plant in Europe, now the Printworks entertainments centre) for £1 – simply to close it down. He kept his staff in a constant state of terror. One journalist, working at his desk, felt a sharp blow to the back of his head. Turning round, he was horrified to see Maxwell looming over him. “Oh,” raged the owner, before walking away. “Mistaken identity.” Maxwell was once so annoyed by the sight of a man smoking in his lift he “sacked” him on the spot with a £250 pay-off, only to later discover the smoker was simply a courier from an outside firm. • You can see this is going to be no ordinary walk, but we will try to keep our heads above the gutter, where the press lies half-cut, and take a more Lord Leveson-ish approach to the days when Manchester was one of the country’s greatest newspaper centres.